Sample provided by @Nozinan Bottle Opened Dec 9, 2017, gassed after each use, 1/2 full when sample was poured April 20th, 2018. Nose (undiluted): no discernable peat at all, dates, raisins, nuttiness (walnuts), dark cherries, definitely seems like a Sherry/Port Cask-matured whisky, a bit of dark chocolate, oak notes, brown sugar appearing after a few minutes. Palate (undiluted): a bit hot on arrival, definitely feels like higher ABV, yet still rich and mouth coating, a bit brighter than I expected from the nose, honey, a little nutmeg, cinnamon, sharp black pepper, and a touch of orange zest, and a vague floral note. With water: nose brightens up a bit, more floral, a hint of citrus (orange? ), with walnuts still very present along side the cherries, palate becomes fruitier and the spices are still present, though not as biting, much like Christmas cake. This is terrific whisky. @OdysseusUnbound how would you describe the colour? There is no right or wrong answers in a guess. I would guess a high rye bourbon (50% ABV Four Roses SB) based on the spice and cherries description but the "pepper", "oak", and nose discription would point me more towards an Amrut. Blind tastings are always entertaining just like a black box challenge for apprentice chefs. I'll keep an eye on the reveal. @OdysseusUnbound....drum roll please.....and the secret elixir is.... _ _ _ _ _ _ _ _ _ _ _ _ _? @paddockjudge My first dram in over a week. 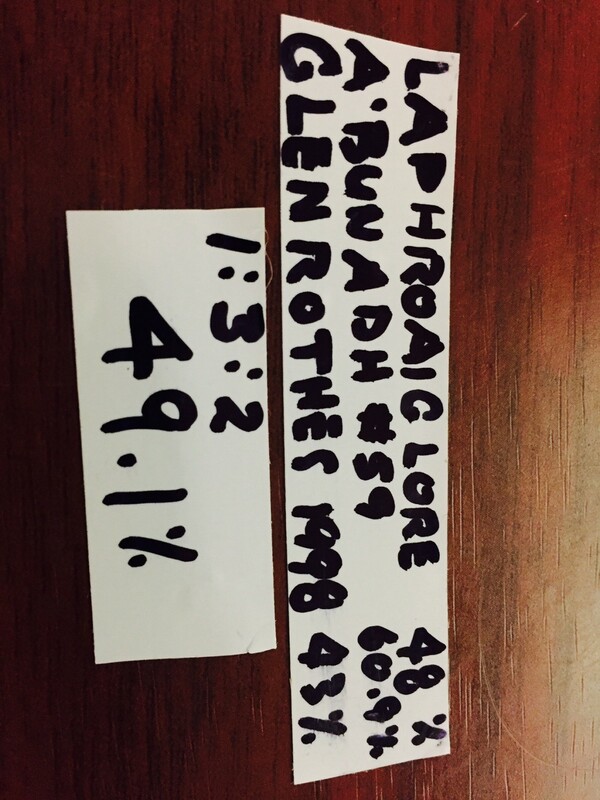 A blended malt of your creation at 49% ABV ratio "1:3:2". Nose: sweet fruity, pear, Apple, green plums, vanilla, touch of smoke, medicinal. Taste: vanilla, black pepper, tar, TCP, iodine, asphalt, medium body - slight dry mouth feel. Finish : pepper, peat smoke, juicy after finish with tart green fruit, medium length. My guess on blend: 1> Glenlivet, 3> Laphroaig , 2> Talisker or Cairdeas 2015(quite malty)? The drum roll (reveal)is your's. 6 months ago 1Who liked this? Cool. I caught a sherry note on the nose but, it was very subtle. The nose is a winner. The Laphroaig dominated the palate, and the finish was a little confused. Overall, a solid dram. 6 months ago 2Who liked this? @paddockjudge FYI: The Abunadh makes it presence known in the empty drying glencairn. I suspect replacing the Laphroaig with Caol Ila could make for a more nuanced balance - "sweet peat reek". @fiddich1980, I welcome your feedback and just might give that suggestion a try. I have a lot of fun making blends...every once in a while something nice comes along. The process is also educational. Owing to my poor reading comprehension, the first "blind tasting" of the samples provided by @fiddich1980 was the one only I have. I don't know where my head is at, but here are my notes. Apologies if they're messy. This small pour (approx. 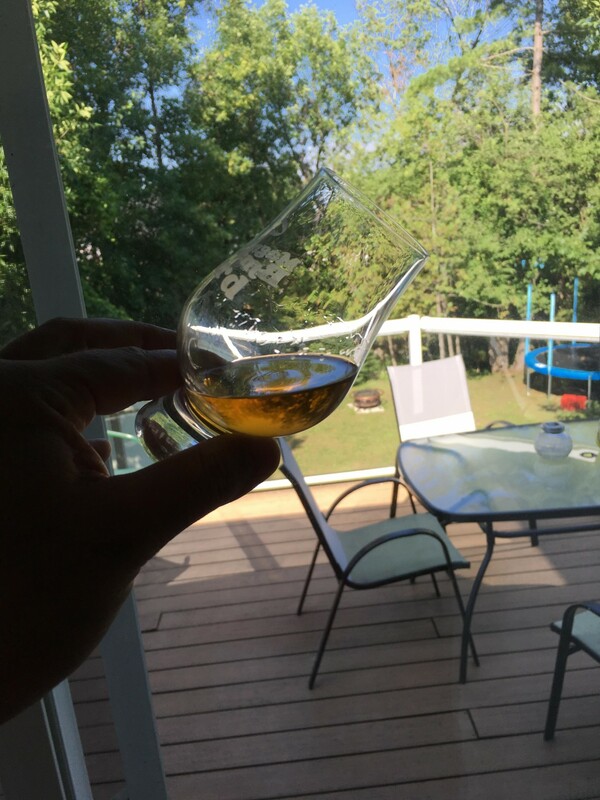 15-20ml) was evaluated neat from a Glencairn glass. Nose: As soon as I open the sample bottle, my first guess is there's Lagavulin in here. It's thick smoke with a bit of eucalyptus. As I pour it into the glass and let it settle, I'm unsure. Ardbeg maybe. The smoke is more Ardbeg than Lagavulin. There's a citrus note that makes me think "yup there's definitely an Ardbeg component here". With a few minutes more, I think there's a fruity note present. Is there a sherry-casked whisky in here? I can't be totally sure. After a sip and more breathing time, there's a "damp grain" note I associate with Ardbeg Ten. I'd be shocked if there was no Ardbeg in this vatting. I have to try and find more than that...After about 20 minutes and a few sips, there's a sugary sweetness on the nose, and the menthol/eucalyptus keeps hanging around in the background. Palate: there's definitely some fruitiness here, but I can't be sure if it's from a sherry cask. I'd guess this bottling strength to be around 48% abv. It's not super sharp or nippy, but not smoooooooooooooooth either. It's comes across "just right" My second sip keeps me thinking either sherry cask, or a fruitier malt is in here. Almost tropical fruit. Could this be Kilchoman? I've never had one, so I really don't know. Maybe it's Caol Ila, but it's not the green apple I normally associate with that distillery. Bowmore, maybe, but it isn't leathery like many Bowmores are. I'm really not good at this exercise. Finish: There's a dark, coal or ashy note that has me thinking Ledaig, or Port Ellen maybe? I've never had Port Ellen, but I know there's some in Big Peat, and the finish here is similar to the finish of the Big Peat sample @Nozinan gave me awhile back. I'm not getting any of the green apple skins I normally get from Caol Ila, so if there's any of that in here, there's very little of it. The tail end of the finish is a lot like road tar, but in a very good way, if that makes sense. Later, the road tar gives way to espresso and then dark chocolate. Best guesses: So I'm not that familiar with many blended malts, but I'll guess that there's Ardbeg, Ledaig, Bowmore, and Caol Ila in here. I really enjoyed this. If I had to rate it after about 20ml, I'd probably give this between 90 and 92 points. Yummy. I may post this as a review once I learn its identity, and maybe once I taste the rest of the sample, possibly with a touch of water added, although it really didn't need it. @fiddich1980 Well at least I picked up on the Ardbeg...and I got the abv pretty close! @OdysseusUnbound I give Compass Box praise for being so transparent. Other, blenders are not very forth right in disclosing the actual componants of their blend. I will monitor your Blind Tasting post on the "Blind Tasting Thread" on Sunday 10 February. Because there are Three samples per person and Six participants please post your impressions of each individual sample. The order of blend sample post will be: A) "Button", After a reveal posted with a listed distilleries B) "Star", After a reveal posted with listed distilleries C) "Blank, After a reveal posted with listed distilleries I know that post coordination will be challenge but, we'll get through. I hope you all found the sample tasting worthwhile. @fiddich1980 Awesome! Is there a particular time this should start? @talexander I will start monitoring posts beginning at 9:00am ET. It will start with a posting a picture of sample bottle "A) Button", and then move on from there. Hopefully, this works out or at least the majority of tasters get a change to post their impressions, given distance and schedules. @fiddich1980 OK that's great. Normally I don't start imbibing that early, but I do have a busy day tomorrow so the earlier the better for me! You folks were suppose to have notes already. There no way that @Nozinan will start drinking before 12pm. @fiddich1980 I've already tasted half of each sample and already have notes for them. My plan was to revisit them on the day of our postings, taste the remainder and build upon my notes if necessary before posting. The 9am start time is when I start to monitor this thread. Hopefully, we'll get through by the end of day. This blind was an experiment among a group of Connosr members from different cities and is subject to variables. Kids have swimming in the morning. Is it ok if I post my impressions of all three in the am? I am hoping to do a retaste tonight and compile my thoughts into one document. @Nozinan Sure, I'll make appropriate adjustments for the reveal. Initially, my impression of this blind tasting was for the purpose of exploring nuances, aromas, and flavours. I did not know these were commercially available blends, nor did I know that we would be guessing the source of origin. I presumed they were @fiddich 1989’s handy work. I will remain true to my first impression and report my discoveries as originally interpreted. Coal tar, black licorice pipes, band-aids, and orange kool-aid. There should be some sulfur, but I can’t detect it for the busy tar and sweet black licorice. Underlying tones of light fruit …ahhh, there’s the sulfur, a cold boiled egg… ten minutes later it morphs to freshly struck match. The licorice fades behind a dusty cloud as confectioners sugar attempts to mask the sulfur, it can’t just yet, but with time it will succeed. Good balance and excellent mouth feel. Honey and ash coat the tongue preceding a peppery tingle, building to a sooty and bitter exit fading into a dry death. Enjoyable I would like to try this at cask strength, in a narrower cut, like X.2 Octo. @paddockjudge The first on "The Button"! A speculation on distillery components? First Impression: I opened the sample and was immediately overwhelmed by a wave of sweet wine. Subtle smoke, faint peat, light fruits (probably from the wet wine casks employed). Honey glaze, a pinch of sulfur, green grapes, ripe pears, clementines in light syrup, apricots . Good mouth feel, a delayed entry then a sharpness bathed in honey, bisquity. Moderate complexity, good balance, pepper and light fruit on the exit, a subtle finish, slightly tannic. There are some old casks at work here contributing to the short finish. I like this one, a lot! Very little peat, very little smoke, very little soot…a JW Green vibe happening here. Apricot, pink grapefruit, ripe honeydew melon, faint floral elements, and confectioners sugar….but a sweet wine note penetrates all of these scents and smells – before, during, and, after. A sharp, tanic, wet paper bitterness cloaks the faint smoke, eventually gives way to a peppery tingle and a dollop of honey. Somewhat discordant, the sweet honey over bitter oak does not give balance; however, it is intriguing. A big peppery bite on the exit, a Talisker tingle. Some old casks working overtime, but not getting a lot of work done. I now know why this one was in the “plain” bottle. A few ice cubes, cranberry juice, and sliced strawberries will dress this one up rather nicely. I have compiled notes in review format, and depending on what comes of this tasting, I may post reviews, but the following are my impressions after two tastings of each sample, ungassed between tastings, 15-20 cc per pour, each not finished. This was the last of the three that tried. On my first attempt I found it very savoury on the nose, with a vegetal component that faded by the second time I tried it. A little smoked ham and apples. The apples and some light syrup were more prominent the second time. On the palate it was quite savoury, more peppery the second time I tried it. With water it became so bitter as to be undrinkable. We were asked to give some impressions about what whiskies are in the blend. While I didn’t clearly identify a signature, the nose of this one, especially on Feb. 9, made me think possibly of an Irish whisky. The savouriness made me think a little of Old Pulteney. I would estimate the ABV 43-46%. I scored this one an 82 (a very generous 77 with water). This one started with a vegetal note that reminded me of cabbage rolls cooking when the smell wafts into apartment halls and grows a little stale. This did dissipate with time and was not very prominent the second time I tried it, replaced with a more savoury note. I would place the ABV at 40-43%, and thought it might include Old Pulteney (because of the original cabbage smell, reminding me of the raw gefilte fish smell of the 12 YO). I would not be surprised if Glenfiddich played a role in this. I liked it better without water (scored 84 vs 81). This was the first one I tried and my favourite of the three. It appears to be bottled at a higher ABV (46% or higher - unusual for blends, but perhaps it’s a blended malt, or just stronger flavours). From the nose and the taste I would think there is some wine cask maturation, and from the savouriness I would not be surprised if a component of this blend came from Cambeltown, perhaps even Springbank itself, though I don’t really detect peat. This one I scored an 88 and preferred with a few drops of water. This was a humbling experience. It really makes clear that book learning is no substitute for experience. It brought home to me that while I’ve learned a lot about whisky over the last few years, I still have a lot more to actually experience. I wasn’t able to taste any of these and say “oh, this one clearly has spirit from distillery X, Y and Q.” But at the same time there is something liberating about being able to have an impression without being influenced by brand. A big thanks to @Fiddich1980 for including me in this exercise and for setting it up. The logistics were significant, getting samples to people in 4 cities, and arranging a time for posting notes and revealing the results. I think that this should be considered a pilot for future exercises that stretch the limits of our abilities to interact on and beyond this site. I think having a ZOOM video tasting (which can be done at no cost, I believe) of something easily accessible could bring together people from around the world! Any takers? @Nozinan, This is the type of exercise "Industry Experts" run away from for fear of embarassment. I think we would be hard pressed to see this (without staging, positioning, or cheating) outside of Connosr. Relative to your comment in the BUTTON about Irish...when I get an Irish vibe in a single malt I immediately think Madeira Casks as the influence, This I found in the PLAIN bottle sample.